Summer in Capitola is here! 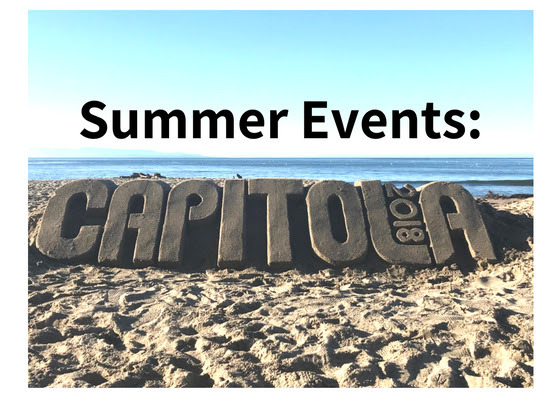 We have put together a list of the Capitola Summer Events as well as some of our favorite activities to add to your vacation itinerary! As always, let us know if you need any suggestions! Enjoy a movie on the beach in front of the Santa Cruz Boardwalk every Wednesday night starting at 9pm from June 20th to August 15th (except July 4th). Click here for a list of the movies playing. Watch the sailboats sail and race every Wednesday, starting at 5:30pm at the Santa Cruz Yacht Harbor. Click here for more information. Click here to view where you can have a beach bonfire in the Santa Cruz area. Experience Santa Cruz at Sea! Swing through the Redwood trees at Mount Hermon through their Redwood Canopy Tours. Click here to learn more and get your tickets. Click here to learn more and get your tickets to watch a Shakespeare performance from July 10 to September 2!